One of the most valuable assets for your company are your systems. Are you prepared? In the event of a disaster or outage, hardware and software can be replaced with new equipment, but unprotected company data with no recovery plan is a big risk. It can cost you serious revenue, expenses, and damage to your reputation each day you are offline. If keeping your systems in production and protecting your data is important, and you cannot afford to have your operations halted for days – even weeks – due to down systems, data loss or corruption, read this report. Our new e-book is a summary of the knowledge we’ve gained assisting organizations to build their recovery plans and assisting with the recovery from a disaster. 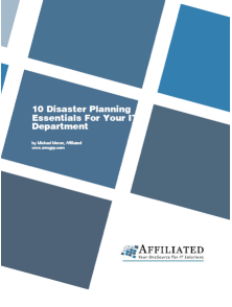 It will provide you with guidance as you think about your organization’s needs, and your readiness to respond to an unplanned outage or disastrous event. If you would like some assistance with implementing your plan, reviewing an existing plan, or any of your IT needs, simply contact me at 614.495.5896. or MichaelMoran@aresgrp.com to discuss your interests or concerns.